2) Customize the desired columns. 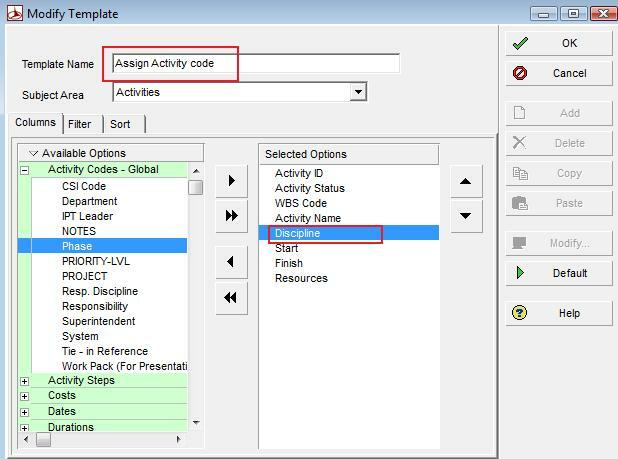 For example: To assign activity code “Discipline” into activities, select “Discipline” column into selected options box. Name the template so that you can find it back when you need. See figure below. 3) After setting up the desired template, Go to Next > Select the Excel file location > Next > Finish. Finally, you will get the excel spreadsheet data which will be imported after adding new discipline codes to those activities do not have discipline code before. 4) Suppose the exported excel file is as below and assume that the new codes, (FABR2 and ERST) would be added to that sheet. Make a copy of your project before importing into existing one. The database field names where the data are in the first row of spreadsheet must not be modified. For example;task_code, status_code, wbs_id,task_name, actv_code_discipline_id, 'start_date,end_date,resource_list, delete_record_flag as shown in above figure. Activity codes (FABR2 and ERST in this post) and resource codes should have assigned (they must exist) in project dictionary before attempting to import. Activity ID should not be changed otherwise can not be imported. Some of the column heading containing (*) sign can not be changed. 5) To import the updated sheet to P6, go to File > Import > select the import format as Spreadsheet-(XLS) > Next > select file to import > select Activities > select the destination project to be imported > Next > Finish. Finally, you will see that these can be updated with a short amount of time using import/export tool. 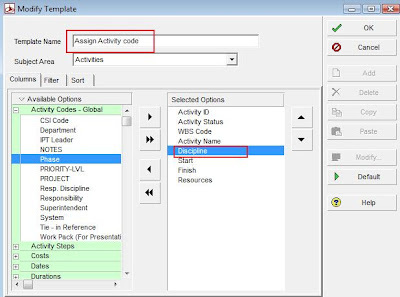 The activity names, WBS code, activity codes and user define fields can be exported from P6 with a very simple way. To do that, go to activity column area > click one of the activities > right click > go to Export to Excel > Select existing file name or give a new file name, and you will get the export file. After you made changes , you may import to P6 using Step-5. Please come up with more posts. very good and detailed explanation. Is there a way to bring activity codes that were added onto a baseline schedule to an updated schedule that has progress? I added an activity code to the baseline and now want those codes on Update #6 with the corresponding activities. Can I export from one project and import to another? Thanks for your help. Is it also possible (advisable?) to edit relationships using this method? Or are there any issues to be aware of?